Based on the latest medical, fitness and nutritional research, Fat Loss Revolution is for anyone seeking to revolutionize their health and experience permanent fat loss. Fat Loss Revolution provides you with simple, step-by-step lifestyle solutions that result in restoration of health, permanent fat loss and a happy, healthy life. This comprehensive book is highly informative and easy-to-understand providing realistic solutions to restore radiant health and well-being for millions of individuals struggling with their weight and various health conditions. Fat Loss Revolution is the perfect balance between helping the reader to understand the revolution of fat loss and living a healthy lifestyle, and successfully applying this valuable information into their own lives. I love this book and highly recommend it. Paula Owens has a knack for distilling the latest research on diet, detox, exercise and healthy living habits into practical, doable and result-oriented programs for her readers and clients. Not only is she right on the mark with her Fat Loss Revolution recommendations, but her recipes are divine. Paula has written a concise, clear, accurate and well organized book to improve your health and decrease your body fat that will last. This is truly Reading Revolution with results! This book is a very good guide to weight loss and to improving overall health at any age. If you want to know the truth about losing weight, and what you absolutely must do to improve your health, this is the book for you. Paula reveals the facts in a compelling and insightful way. This invaluable book belongs on the bookshelf of anyone who wants the truth to experience lifelong health and lasting fat loss. Paula Owens not only understands how fat loss works, she explains it in easy-to-understand terms that will make perfect sense and leave you excited to get started immediately. Do what she says for 12 weeks and you’ll be thanking yourself forever. 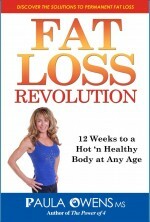 Paula Owens has written one of the most comprehensive resources for anyone looking to shed fat pounds. Not only does she cover diet and exercise, but she also guides you down the rabbit hole of those hidden factors contributing to weight gain including food sensitivities, toxins, mindset, and even parasites! This one is a winner. Paula Owens is one of my go-to experts when it comes to nutrition, fitness, hormones and lifestyle for women. I first met Paula at a seminar close to 15 years ago and ever since she has continued to invest in ongoing education, seeking out experts to learn from, and applying what she knows with herself and her clients. She is one of THE MOST KNOWLEDGEABLE people I know when it comes to fat loss for women. How you look on the outside is a reflection of how healthy you are on the inside, which is exactly why Paula’s approach works. The information in her book leads to a healthy body inside and out, with balanced hormones, optimal health and looking fabulous! She covers EVERYTHING in this book, giving you her secrets, lists, recipes, workouts and tips to guarantee you find your own hot and healthy body. Teach a girl to diet and she’ll always fail; teach a girl to lean out through hormonal balance and detoxification and she’ll be lean for life! I truly love this book and think it’s so **** smart. The Fat Loss Revolution is THE go-to resource for the woman who wants to settle the score between herself and her body–for good. Paula gives you the straight dope on clean eating and fat-burning exercises that will help you shed unwanted pounds and have the body you never thought possible, no matter what your age or your starting point. She is living proof it can be done! Paula knows how to get results! If you have tried other diet books and found them lacking, fear not, you will love the ‘Fat Loss Revolution’. Move over Dr. Oz….here is Paula Owens with the absolute truth about long-term fat loss and healthy weight loss. If you wish to get in shape just follow the book’s instructions to the tee. This book should be in every home library.